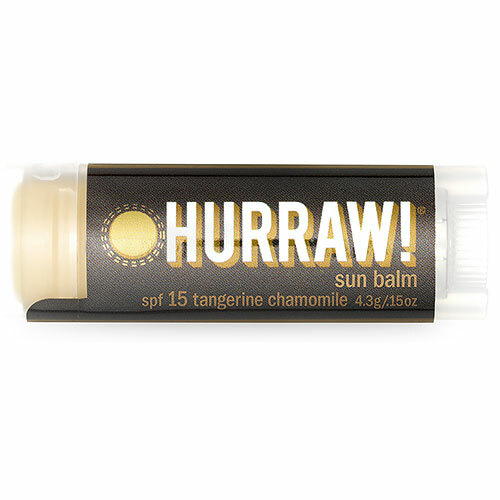 Glides on silky smooth (and virtually clear) like Hurraw`s regular balms but they formulated it to be extra thick and creamy for longer staying power while out in those shining rays! Juicy Tangerine, Roman Chamomile and a hint of Vanilla make it nourishing and calming for your lips. Packed full of amazing cold pressed oils to moisturise, protect and heal. Hurraw use non nano Zinc Oxide in their Sun Balm. Zinc Oxide is an all natural, broad spectrum (blocks both UVA and UVB) sun screen. Zinc Oxide is a mineral. It protects your lips by sitting on top of them and thus, provides a physical barrier against UVA and UVB rays. It actually deflects the rays away from the skin to prevent any harm. Active Ingredient: Zinc Oxide (Non-Nano) 17%. Ingredients (INCI): Carthamus tinctorius (safflower) seed oil*, Zinc oxide, Cocos nucifera (coconut) oil*, Euphorbia cerifera cera (candelilla) wax, Olea europaea (olive) fruit oil*, Ricinus communis (castor) seed oil*, Rubus idaeus (raspberry) seed oil*, Theobroma cacao (cacao) seed butter*, Aroma, Tocopherol, Helianthus annuus (sunflower) seed oil, Hippophae rhamnoides (sea buckthorn) seed oil*, Punica granatum (pomegranate) seed oil*, Citrus aurantium dulcis (sweet orange) peel oil, Citrus reticulata (tangerine) peel oil, Anthemis nobilis (roman chamomile) flower oil, Vanilla planifolia (vanilla) seed*, Anise alcohol‡, Benzyl benzoate‡, Limonene‡, Linalool‡. (‡natural component of essential oil or aroma). For adequate protection it must be applied often. Below are reviews of Hurraw Sun Protection Lip Balm - 4.3g by bodykind customers. If you have tried this product we'd love to hear what you think so please leave a review. Very nice balm. It tastes good and moisturises my lips well while protecting them from the sun. The only quibble is the price which is quite high for a lip balm.